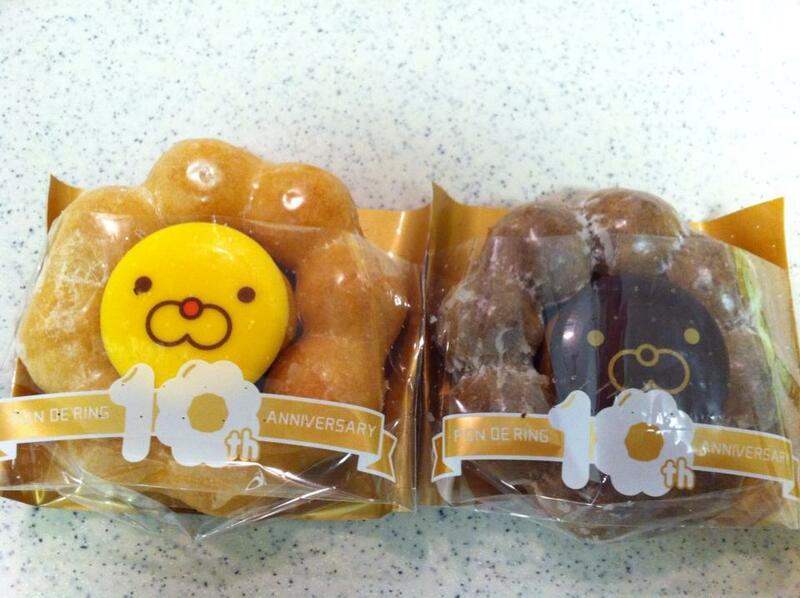 This is Mister Donut's new limited time donuts called Pon de Lion Donut to celebrate Pon de Ring's 10th anniversary. 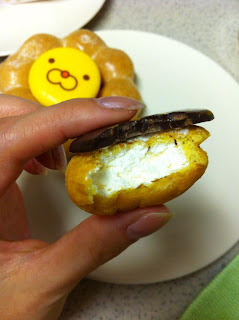 Mister Donut launched this lion donut on January 23, 2013, which was about 2 weeks later after Pon de Ring Nama was sold. 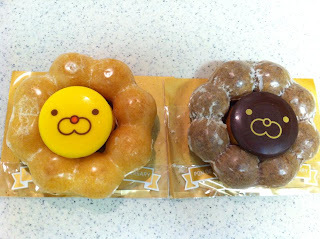 This Pon de Lion has 2 types; regular donut (yellow face) and chocolate flavored donut (brown face). They're individually packed in a 10th anniversary plastic bag. 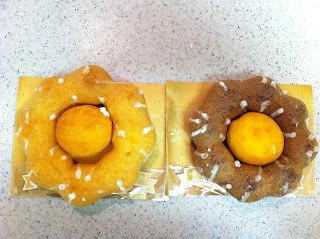 Same as when Pon de Ring Nama came out, donut shop had a line of people waiting to buy. It might have been because they're having 100 JPY and 120 JPY sales, however these limited series were not on sale. I dropped by at one of the shops located in Shinjuku station, and they only had regular donut (yellow face). The cashier said they only had the yellow lion that day. I asked her till when they'd sell the lion and she said till the middle of March, but if supplies would be gone, they'd stop selling the lion earlier without notice. At least I could get the yellow face Pon de Lion, but I thought I had to get the brown face one soon. 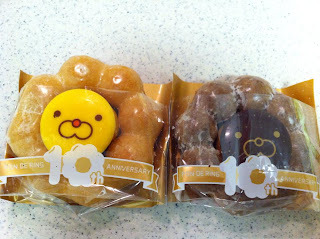 I knew another shop in Shinjuku on my way home and I went there after getting one lion and 2 other donuts. That shop had a waiting line to order but I didn't see anybody was getting Pon de Lion at all. And coincidentally, they only had brown face one so that my mission was completed in a day, even like 30 40 minutes. Pon de Lion without plastic bag. I wanted to see how they put the face on the Pon de Ring. They put a ping-pong size ball donut under the face (made of chocolate). From the side, it's easy to see the ball set in the middle of Pon de Ring is holding up the Lion's face. 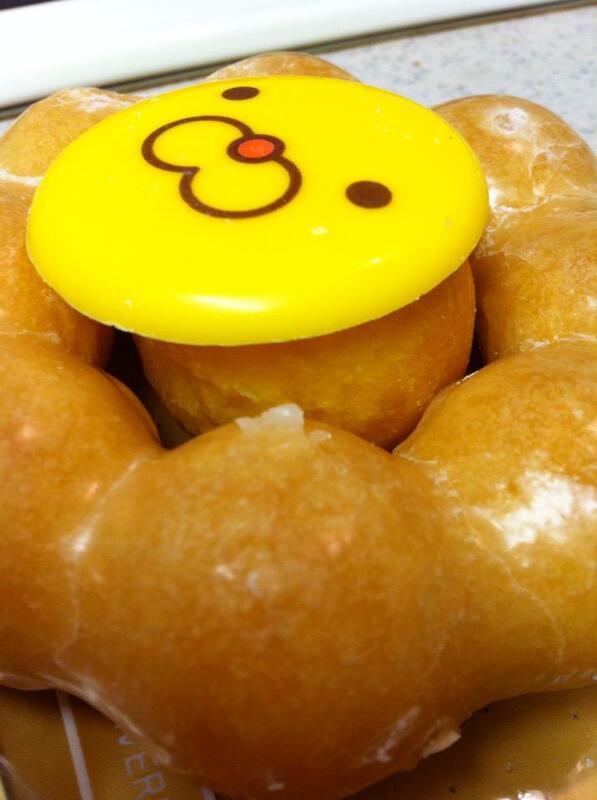 Back side of the donuts. Look like they have big mane and small body. Inside of the ping-pong size ball. It's filled with smooth and soft whipped cream. The webpage doesn't say this Pon de Lion uses Pon de Ring Nama, but the texture was close to the Nama. This donut is special because it's not a permanently sold line but technically they're using ordinary ingredients with special chocolate face and anniversary package. Pon de Lion Donut: 189 JPY each.